Hi, I just received my order today and was dismayed to see that the fast luck bottle had its cap opened and all its content spilled out during shipment. I noticed that the cap of the bottle wasnt taped and LM might wanna consider getting it made screwed on rather than cap on cos it doesnt seem to be capped on securely. Call the shop or email them and tell them what happened. 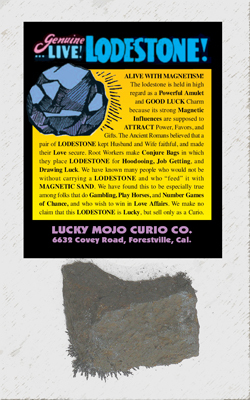 The Forum is not the same as the shop, you will get better and faster assistance by going to Lucky Mojo directly. On the bright side...everything was already anointed when you got it. Now that's what I call Fast Luck. Hi!Good Evening. I ordered red candles and 4 of the candles were half melted. Is it okay to use them. Thank you for your time and assistance. So i made a order of oils last week and they showed up. For some reason i had ordered follow me girl but on lucky mojo's side it said i had ordered follow me boy. I checked my order online and it shows i ordered follow me girl as well. So maybe there's something getting crossed there. I would return it but im lazy plus my mother was like oooooo ill take that lol. Maybe your mom needed the oil more than you did. Well thats the thing. on my side my cart says i ordered follow me girl. but when i got the receipt from LM in my package it says follow me boy on it. So im guessing something is getting crossed on their side. I have waited for few weeks for my mojo hands, finally I got them. I also help my frd to order some items, but I found that the bag i am longing for is...get wet with the oil. I just opened the box, and found that only the bottle of my mojo hand is broken...oil gone and the bag get wet. Does it mean anything? Can I still use it? You should call Lucky Mojo with your concerns Ashley. I have just received my mojo hands, I have order totally 4 mojo hands, and the oil bottle of one mojo hand is broken, and the oil is gone. As I order the bag with my friends, but only the one I most concern is being like this...does it mean sth? And can I still use the mojo hands? We are not going to be able to tell you what this means or what not. I would get a reading about your concern. Yes you can still use the mojo bag, but you need some oil to feed the mojo bag. The bag I concern most is for getting back my lost lover...You suggest me to get a reading about that?? It's lucky that my frd suggest me to order another oil, so I still got oil for my mojo hand. But it's full of oil now, so still need to feed?? I haven't opened it and read the instruction yet, don't know if it is activated at the moment....sorry i am green to these. You posted the same question twice, which is overkill -- we reply once per question. The excess oil on the bag may make it a bit too funky to use. The meaning? You live in another country (i know this from your previous posts) and along the way from us to you, some careless post office worker dropped the box or smashed it. Things happen. You don't need a reading on a damaged package -- it's just a broken oil bottle. Inconvenient, yes, a sign of disaster, unlikely. No one from the Lucky Mojo customer service department or shipping department reads this forum. The number to call for those departments is 707-887-1521 -- or you can email the office at order@luckymojo.com and it will be picked up first thing in the morning. The Lucky Mojo shop is open 7 days a week, 9:00 am to 5:00 pm Pacific time. If you have a digital camera and can attach a photo of the broken item, that'll speed things up. They'll fix you up with a replacement item -- but you've got to call or email them, okay? Sorry for post the topic twice. As I don't want to wait for few weeks, Is it okay if I clean up the bag and use it? Sure, you can clean and use it, of course -- but do contact the shop to get your free replacement oil! The number to call for those departments is 707-887-1521 -- or you can email the office at order@luckymojo.com and the email will be picked up first thing in the morning. The Lucky Mojo shop is open 7 days a week, 9:00 am to 5:00 pm Pacific time. If you have a digital camera and can attach a photo of the broken item, that'll speed things up. I just wanted to let folks know that when my package arrived, one item (a candle) was broken. I called the shop, spoke to Angela, and she put the replacement in the mail immediately, no questions asked. I got the replacement candle in good shape, and all's well that ends well. So don't worry about damaged items. It happens sometimes. Call and talk to Angela. She's very nice about it. I'm not sure what all the fuss is about in this thread. I had a package delivered to Ireland, an oil was broken, I cleaned it up, emailed the shop for a replacement, and 7 days later, there was the replacement bottle. I order a lot online, and Lucky Mojo is one of the better packers, and one of the fastest to replace damaged goods. That may have been an order entry error on the part of the office staff. The two skus (product codes) are similar. If you ever receive a wrong item, please contact the shop -- NOT THIS FORUM -- and give your invoice number and describe what is wrong. Customer satisfaction means a lot to us and we will go the extra mile to make it right for you. Happy new year! I bought a tarot of marseille deck at the store about a month ago and I realize now it should have come with an instruction booklet -- but it didn't! Do you guys have any extra ones at the store (maybe mine fell out...)? A booklet would be especially helpful for reading this beautiful deck of cards, since not many tarot books I've seen address this deck specifically. Please let me know if you need to order number or anything. I still have the receipt! Yes, passionflame -- call the shop. We sell so many different tarot decks that it would be difficult to tell you if it was a manufacturer's flaw or if that deck was designed without a booklet. Also, we don't know your name here as you are using a handle. Just call the shop. Ask to speak to Robin, the shop manager and tell her who you are and when you bought the deck. She will find you in our system. She is in-store from 9:00 am to 5:00 pm Tuesday through Saturday. She is the one who will be able to help you best. I just want to know if I can still go ahead and burn this candle or will th fact that is is broken affect the outcome? I would call Customer Service, they will probably send you a replacement. I'm sure you are super excieted and ready to start your work but I would wait for the replacement, better to work with the proper stuff. Because if you doubt your work (like, if you don't see results - you may worry -oh it was because the candle was cracked - etc) that doubt may affect the outcome more than the fact that the candle arrived damaged - make sense? That, and if the glass has been compromised structurally, the heat from the candle may cause it to crack and break even worse - and if your candle is lit wax will pour everywhere and make quite a mess! Call the shop. We replace broken goods. i have sent an email to orders@luckymojo because i am all the way in London, UK. is there another address i can email to? Email is fine. We replace broken goods all the time. Please address your question to the Deacon candle servers at Missionary Independent Spiritual Church. There may have been an email glitch, but they have a database record of every email candle report they have ever sent, so they can resend it to you. Be sure to state the full name under which your order was made and the name of the specific candle that was ordered to be lit, so they can locate the records in the database. I'm sure that they will get right back to you. Today I recieved my order which had one item missing and all candles leaked and got messed up. I never had this problem before. How can we resolve the issue of missing item as well as candles all leaked out? Please call the shop. One of us will be more than happy to help you out! I purchased a black male figure candle to do some crossing work. (The candle is to be smashed with a hammer, not burned.) It arrived broken. Any suggestions interpreting this would be great! On the mundane, it could just be broken because sometimes it happens. Or it could be a sign that the work is just not meant to be or the timing isn't right. A reading should tell you whats going on. Is the candle still useable though?? Can the candle be used for another purpose, assuming that the broken candle is a sign the work should not be completed? Just call the shop and ask for a replacement to be shipped. This forum is not the shop. You need to contact the shop regarding broken, lost, missing, or wrong items in your shiopment. This thread is being merged into the longer and ongloing thread where people ask about lost. broken, missing, or wrong items and get told to contact the shop. I brought a commanding mojo hand and there was not loadstone in it. The mojo hand had a bay leaf, magnetic sand, salt, and wishing beans. A lot of the ingredients were missing from my mojo hand. Also, I noticed my lucky coin has gone missing too. I don't know where it could even be. I thought maybe I put the lucky mojo coin in the steady work mojo bag, but it isn't there. Why are so many of my mojo things dissappearing? Why did my yellow cross candle turn to a white cross candle? Do you mean that your cross candle actually changed color or that you received a white candle instead of yellow one? I mean my candle actually changes color. I think I am super powerful and the spirits are around me. I have no idea what you mean when you say you are super-powerful and your candle has changed colour. So i will not address that issue at all. (B) they were expecting a small, medium, or large Lodestone (of the kind we sell individually) and did not realize that we use pebble-sized Lodestones, a.k.a. 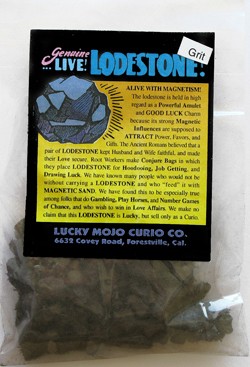 grit and gravel sized Lodestone, in mojo hands as this is the traditional size, to keep the bag from being to heavy or too big to conceal on the person. The other 1% take out all of the ingredients from the bag and lose pieces and then make false complaints to us to try to get replacement ingredients. You go on to say, "A lot of the ingredients were missing from my mojo hand." That sounds bogus to me. Most of our mojo hands are made by Heidi and she has been making them for six years. he has made thousands of them. She lays all of the ingredients out on a paper. She follows the list of ingredients that comes with your bag. She goes down that list one item at a time. She places the items in the bag, and then she prays over it and ties the bag. What you are saying is pretty insulting to her and to our company. Call the shop and ask to speak to Heidi. Seriously -- she is very patient and she will try to help you. Finally, you say that you took your lucky coin out of the bag and "thought" you placed it in another bag and now you want US to tell you, "Why are so many of my mojo things dissappearing?" Well, honey, you need to look at yourself, not at us. Messing around with your mojo bags is not the right way to work them. Blaming us for your carelessness is not going to win you luck, either. I hope that you do call Heidi. I am sure that she will patiently explain to you that NOTHING was missing from your mojo bag. I just finished day 2 of my cone to me spell kit. I just realized one if the candles has no wick. It was next in line to be kit so i moved in and kit the next candle. My question is what do I do? Finish the spell with only 6 candles, replace the candle in the middle if the spell, or scrap it it's no good now with a defective candle? You can replace it with another candle, and burn it last in the series. Candles don't have to match, by the way -- I've been known to start a honey jar with chime candles and later switch to full-sized tapers. I change the colors and the dressing, too, as the situation demands. Call the shop and get a replacement candle. The non-figural candles we sell -- 4", 6", 9", 12", glass-encased, tea lights, etc. -- are made in factories by people operating large machines at high speeds, and sometimes there are candles without wicks. We see maybe 15 or so wickless candles per year, of all all kinds, from 4" and 6" on up to the big glass encased vigils. Wickless candles are replaced at no charge, of course. Our figural candles are made in two-part moulds in which the wicks are strung through the mould, top-to-bottom, and the mould is then held together with clips. The moulds are set upside-down in stands and the wax is poured in from the bottom. Hwen it hardens, the moulds are removed and stored for re-use and the candles are hand-trimmed. That is, the mould-seams are trimmed or burnished smooth, the protruding wick at the bottom is cut flush with the wax, and the protruding wicj at the top is trimmed to a standrad length. There is virtually no way that such a candle can be made with a short wick or no wick, as each piece is set up, poured, trimmed, and examined by a professional candle maker, not by a machine. -- and when you get them on the phone, tell them you sent the photo by email and ask for a replacement! We ship out thousands of candles per month and sometimes they are defective or they do break -- rarely! -- and we ALWAYS replace them for free! Thank you for your responses. I placed an order a few days ago that included pink candles so I will call today to make sure it will get here before I finish. I just wanted to make sure it didn't mess up the spell if I replaced a candle once I already started. Also sunce this candle was in the second position in the circle previously should I rearrange them so it is last in the circle or does it not matter the order you burn them in the circle as long as you burn one a day? The order is not important. Doing the work in a regular manner is more important. Hi. This is my first post ever, so please excuse any and all. : ) Up until now, I was reading around the forum, trying to find info I need in old posts. I just received my shipment from LM, and two of the glass-encased candles have broken off at the top during shipping, like the whole circle around the top, and a bit of chunks on one side of one candle, basically the top inch on the one candle, two and a half on the other, is glass free. I hope that is not an omen! How do I proceed to burn?Sure I could place a disposable plastic bowl underneath each to catch the wax, but wouldn't that ruin candle divination, the fact that some of the glass is gone? Any advice, or thoughts appreciated. Thank you. We ship out thousands of candles per month and sometimes they do break -- rarely! -- and we ALWAYS replace them for free! Thank you, Catherine. That is very sweet, and generous. What should I do with the broken two I got, light them, chuck them? I followed your instructions to the letter , called and talked to Alicia, she was very nice, she checked the emailed photos, told me to toss the candles, for fear of exploding glass, since it's been distressed by breaking. She was filling out the invoice before we even hung up. She said my candles will ship today. Yay! MOprincess wrote: What should I do with the broken two I got, light them, chuck them? Most of the candles I burn are salvaged broken candles. I NEVER light them in the original glass. I melt them in a solar oven or a slow conventional oven, or sometimes in a pan of simmering water on top of the stove. I salvage the wick and hot-glue it into a cleaned, recycle-ready candle glass, and then pour in the melted wax. Sometimes I throw away the broken glass, but usually I wrap it in newspaper (so no one cuts their hands on it) and recycle it. Wow, thank you Miss Michaele, great advice, that sounds awesome what you do. I'm just a total klutz when it comes to pots and stoves. Throw in a non-food ingredient, and I'm lost, lol. Such a waste though, those candles, I wish I could do what you suggested, sigh. Oh, well. Honestly, I haven't had the heart to throw them out yet. Help! Not sure what to do. In the middle of a 7 day moving candle spell and my figural candle is flawed on production! It was burning fine and then all of the sudden went out. Upon examination, I found out the candle wick pulled right out and only went as deep at the chest of the candle! Flawed on production no doubt! Any advice would be appreciated! Thanks!!! You mention that you "pulled the wick out." Obviously, if you did that while the candle-wax was warm and soft, you ruined your own candle. However, if the wick was short, and if you purchased this candle from Lucky Mojo, please send a photo of the defective candle by email to order@luckymojo.com -- and title the email "Defective Candle -- Need Replacement." A replacement will be sent at once. Miss cat has explained previously that due to the way the wicks are held and strung in the moulds of hand-made Lucky Mojo candles, it would be near-impossible for a wick to "run out" in the middle of a candle. If you bought the candle from a different company, contact that company for a replacement. Remember, folks, candles are tools of use. After you fix and dress them, they are elements of your magical works, but when you first receive them, it is in your best interests to examine them just as you would examine a pair of shoes or a book that you ordered via the internet. Don't wait until you are in the middle of a 21 day run of candles to realize that one of your tea lights was wickless or that your figural candle is broken. Look over your packages of goods as soon as you open the box and report any faulty or damaged merchandise to us at once. Send a cell-phone picture! Get a replacement candle. WE REPLACE FAULTY AND BROKEN CANDLES FOR FREE. Thank you for the reply! when I say I "pulled the wick out" I meant it was a half inch piece of wick floating in a pool of wax at about chest level for the candle. It had floated out when it had reached it's limit of burning as a wick. I then examined the rest of the candle once cooled and could not find another wick deeper in. I did not buy this candle from lucky mojo (yes, lesson learned) but from a local and reputable business as I believe in supporting locally too. They do sell LM products but I don't know if they order their candles from there or not. I do not know where they get there candles from but intend to find out. I am NOT looking for a replacement from LM which is why I didn't post here. I'm actually looking for advice on what to do with the work now? I'm not sure what happened to the replies I had gotten before but I wish I could re-read them. I believe one advised doing a reading and I wanted to reply to it as I did....are the replies still there?? Again, I apologize about any confusion but I was not looking for a replacement but for working advice. Thanks!